If you are looking for a Terracotta roofing tile, composite Polysand Roman tile is your best choice. It replicates the look of a terracotta clay and concrete tile only 3 times lighter and stronger! 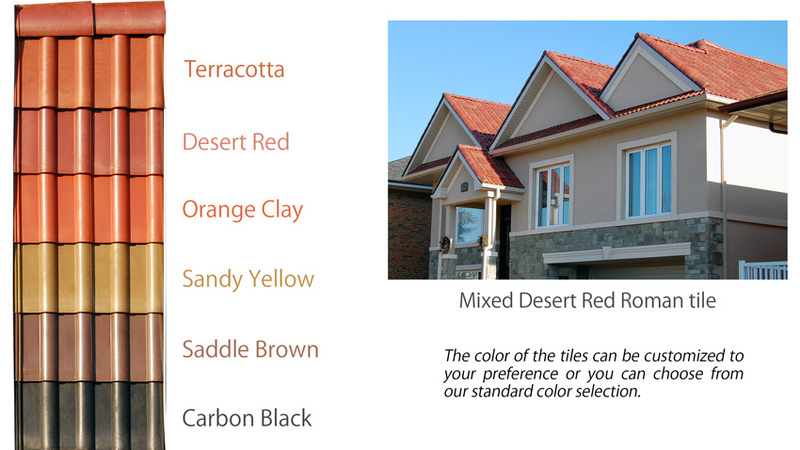 Its beautiful aesthetic look paired with the quality of Polysand™ composite material makes it the best available roofing tile with the look of traditianal terracotta clay tile. Polysand tiles will not fade over time as we use high quality protection system and color pigments. Our roofing tiles are virtually unbreakable and can withstand temperatures from -60C to +80C degrees. The weight of one tile is only 3.85 lb. It is 2 times lighter than a concrete tile. Polysand synthetic roof tiles can help lower energy costs by reducing heat transfer through air circulation under the tile. Our composite material makes our tiles soundproof. You will not hear any noise when it is raining and can sleep peacefully vs. metal roof. Our tiles are light in weight and therefore don't require roof reinforcement, making transportation and installation easier. 50 year warranty on roofing tiles.